I’m not sure there’s anyone in the world who enjoys their jobs as much as the Hearthstone dev team. Every time you see those people, they just radiate joy. Even from the other side of a monitor, a thousand miles away, their enthusiasm is contagious. For example, consider this video that cut the final Witchwood card reveal stream down to just Ben Brode’s laughter. Six minutes of it. If you can watch that without cracking a smile, I’m sorry, but there’s a really good chance you’re a replicant. Seriously, just try it. You can’t, can you? It’s just not possible. However, this post actually has a completely practical point. (Maybe.) If you’ve ever wondered how a Hearthstone expansion gets made, the team has released a behind-the-scenes video for you. I’ll warn you in advance: It doesn’t actually tell you much about how Hearthstone expansions get made. It is, however, infused with the abundance of goofiness that defines Hearthstone (and the people who work on it). The most interesting thing here, I think, is the discussion of Shudderwock. If you aren’t familiar, Shudderwock is a new (and nightmarish) Shaman card that, when played, re-casts every Battlecry you’ve played this game, all with random targets. When you play Shudderwock, all hell breaks loose as countless Battlecries are cast on random targets. It’s pure chaos, and while it won’t always win you the game, it is always really fun to play. But apparently it was a bit of a terror to design. 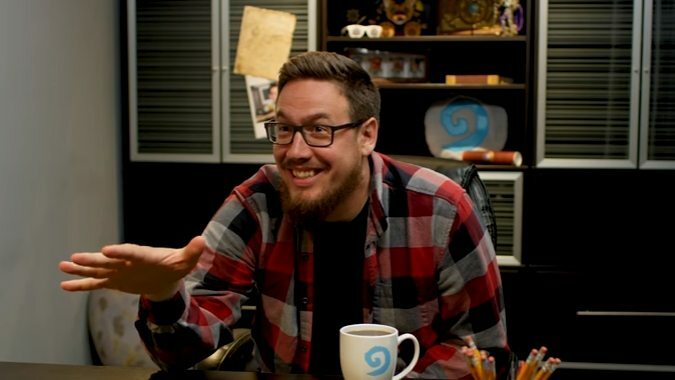 Ben Brode notes that the Witchwood has some of the game’s craziest cards yet, and of those, Shudderwock is the most complicated. On the surface, it seems simple: You check the Battlecries that have happened in the game and then repeat them, one by one. But while there are a lot of simple Battlecries — doing things like dealing damage or buffing a minion on the board— there are a lot of complicated Battlecries, too. Figuring out what order they would go in and how they interacted was a huge challenge. But if the idea of a look behind the scenes doesn’t catch your attention, the video wraps up with everyone giving their best Worgen howl. That’s pretty much a must-watch on its own.